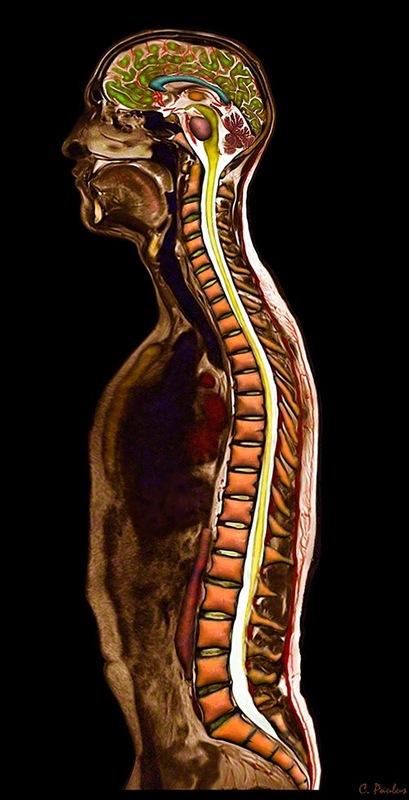 Medical Media Images created several new Color X-Ray images showcasing the use of Artificial Disc Replacement Devices to help patients with Disc Degeneration. These color X-Rays show Artificial Disc Replacements in ways never seen before. This image is a front-view Color X-Ray showing a "Prodisc-L" Artificial Disc Replacement Device placed at the second lowest Disc level (L4/5) of the low back. 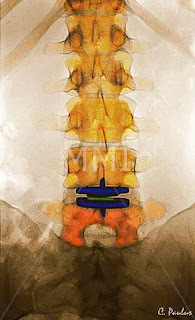 The blue parts of the Device are the metal plates which are attached to the Vertebrae above and below the Disc. The green part is the flexible plastic core which allows the device to move, similar to a normal Disc's motion. This image allows viewers to appreciate what the Devices look like and how they function. Medical Images like this one are ideal for Physician's Websites and in print for the office! !